I have no clever or semi- witty line to begin this story. I have only the deep need to tell it, to allow it to spill from me, to share as I process what His purpose was in all of it, and to call forth His praise and glory. I know some of you all may know varying details from what happened this past Saturday but in wrestling with how I am feeling about it all I have more to say. My husband and girls were electrocuted and they all could have died. Jason was sure, in fact, that they were going to leave this world. But our God is a God of miracles. They are with me and I cannot express the gratefulness and awe I feel. Mungu ni Mkubwa. God is BIG. He really is. Saturday morning I left early for a ladies day and after sorting the meals for my family in my absence I kissed them goodbye and was off. Later that day they were swimming at a recent acquaintances home here as they were given keys and asked to check in on the house and enjoy the pool while this family was away. They went swimming and were playing ball and chasing chickens in the yard when Anni spotted some shells scattered along the wall of the house and asked J if she could play with them. After doing a once over and not noting anything that looked dangerous (open wells and other hazards are common place here) J said she could play as long as she watched her sister and he sat down not far from them. What we can piece together at that point is that Anni must have touched a faulty, shorted out AC machine that had a metal grate around it and was shocked and the force of the electric current sucked her little body up against the grate. We think Evy went to help her sister and was sucked in by the current as well. They both managed to get off what Jason described as a piercing scream and he ran to help them. Thinking they had gotten their arms caught in the grate he reached out to help and was shocked and thrown down but not out of the path of electric current. The three of them were stuck there for what to J seemed like minutes while electric currents passed through their bodies causing what J described through many tears as the worst pain he has ever felt. They were all paralyzed and unable to escape the voltage. He yelled in pain and screamed and asked God for mercy and for Jesus to save them. Seconds later a local man came running around the corner and saw what was happening and disappeared again for what felt like forever. He reappeared with a wooden board and began to pry them off one by one using the board as a grounding to prevent being electrocuted himself. After realizing he was still alive Jason stood and tried to run only to have his muscles collapse under the trauma his body had been through and fall to the ground. He quickly knew Annikah was not doing well. She was unconscious, seizing, and foaming at the mouth. With the help of the man who had come they scooped up the children and Jason drove them all to the hospital on the island. J also called our team leader, who by the grace of God had not been an hour and a half away on a fishing trip as planned, to meet them there. The doctors had no clue what to do and very quickly accessed that their conditions were not treatable there and they needed to be evacuated off the island. Jason was praying and praying and soon the room filled with folks and onlookers. They decided to leave the hospital and try to arrange the flight which required insurance approval and many other details that needed to be arranged. I missed all this. Probably by the grace of God as I do not think I would have had the clear strength and ability God gave Jason to care for the girls in those first moments. I was reading on the beach when I got a calm but terror filled phone call that I needed to return as they were going to medivac-ed from the island. I was shaking and my friends prayed for me and the situation. We all grabbed our stuff and started on the hour long car ride back to the city. On that ride I had limited information, limited cell phone coverage, but we knew we had to pray. Pray for mercy, pray and thank God He was there. That hour and some minutes were the longest moments of my life. I watched out the windows as women carried firewood on thier heads, as men drove bicycles loaded with their crops to sell, and children darted around playing and running and carrying water. It was just normal life here in this precious place but for me my life was changing forever and I was keenly aware there was a battle for my heart; between trust and soul gripping fear. I felt weak. I sobbed, I prayed, I hummed the song He gave me. My sisters that were with me prayed for me, for Jason and our precious girls. We praised Him for His protection even in the midst of crisis and I knew to my very core that I would not allow this incident; no matter the outcome, to steal praise from my lips. I knew that for sure. It was a heat that rose from my gut and this song was with me... I am no singer but I hummed this song from Psalm 100 in the quiet and long minutes as we inched towards town. We worship You for who You are. We worship You for who you are and You are good. You are good all the time,and all the time You are good. And it became truer as the time wore on. It is true. I told my friends that Satan was not going to use this in our lives to drive us away from trusting God. I claimed it and I spoke it because I knew it was true but I also held terror in my bones that I might be put to the test, to be counted worthy of suffering something I could only imagine in those moments. And I knew I would still praise Him but I also knew I would need their help to hold my hands heavenward. I needed to speak it for it to be true. We continued on the drive with spotty communication with Jason; "they were headed to the airport, "the helicopter was there," "just please pray- Anni is not ok." I sobbed, we prayed, I hummed the song more, and we inched closer. We called friends and tried to see if there would be another flight out tonight if I missed the chopper and the next flight was not until 9pm. It was around 5 or 6pm then. I just prayed we would make it and as we burned past police checks with a simple "her children were in an accident" in Kiswahili they encouraged us to continue without any problems. We finally rounded the corner that meant we were on the road towards the airport, minutes away and I called Jason who was boarding and simply yelled through the chopper blades "hurry!" After that call the car started to die minutes away from the airport. I remember laughing. Odd I know but I just knew this was ridiculous. Us women called on the name of Jesus to get that little car "just to the airport...please Lord just to the airport" (I was told later it died there) and it made it. I bolted from the car and ran through the airport and past security to the huge glass windows and I saw the helicopter. I remember very little from those moments except that I saw the chopper blades rotating and I just had to get on that thing. I was a hollering, crying, blubbering mess at this point and I am pretty sure I pushed a few workers who were insisting I would not get through because I did not have a ticket and that I needed to stop crying and follow procedures. My Kiswahili was clear and loud and I was getting on that chopper to my family. I was totally "that" crazy white lady hollering and yelling and creating a scene. I was aware of this but it was as if I had no control to stop it. The blood pumping through me was dictating I was going to board that helicopter if it meant stampeding anyone in my way. The chopper co-pilot saw me and came running to tell the airport staff to let me come and I burst forward in a full run until I was on board with my family. They were a mess, I was a mess, and we could not hear each other over the chopper blades so we just prayed and tried to piece the story together. Annikah still did not look good and was vomitting and totally not present. Evy sat on my lap and hugged my neck and I knew she would be ok. I don't remember much from the helicopter ride except that the sunset was beautiful; reds and pinks, and blues as the sun slipped away over the ocean. The South Africans flying us were extremely kind and reassuring and smiled at us as we prayed. Jason still was unable to tell me about anything that had happened but did manage to crack a joke that I finally got the helicopter ride I always wanted. Hans was there with us and was a blessing as we were all unable to think through what needed to happen next. We arrived and an ambulance met the chopper and we loaded in and made it to the Trauma Center minutes later to a staff that immediately started treating Annikah. After a few minutes Jason went to change out of his wet swim suit and after he came out of the bathroom he collapsed on a chair and wailed. I have never heard him cry like that. I just knelt down and prayed for him and told him we were going to be ok, no matter what happened, we would make it through this. Annikah never regained full consciousness that night but she showed signs of improving. I slept with her in the small hospital bed and all throughout the night her heart and oxygen levels were measured. God sent a friend of a friend who had been through a terrible trauma to pray with us and bring the girls clothes and we were again reminded the family of Jesus is awesome. Annikah woke up the next morning and glanced over at the EEG machine and asked me if she could play the cool video game and she also said she was hungry. I cried. She was there. She was still there. That was the first sense of relief I had and it swept over all of us. The next few days were a mixture of worry, joy, rest, sharing, and worship. My earthly family is with me. Right now Evy is taking a nap, J is resting, and Annikah is keeping me company at our dining room table doing "art projects" with way too much glitter. The God of the universe and our Father saw fit that they would be able to stay here for a time. It is not promised but it is all blessing. There is no logical explanation for why they are here, for why they did not have brain swelling or heart issues save that those that call on the name of Jesus can rest in His power. God still has work and life and pain and joy for them and for that I cannot adequately express in either language I know my gratefulness and my worship. The Lord gives and He takes away and He calls those who follow Him to stand and proclaim His goodness in either outcome and all in between. If He gives we gladly and freely receive and stand and praise and if He takes we stand and praise. In the latter I will still stand, with shaky knees and you all; my sisters and brothers would have had to hold my hands for me because the weight of pain may obscure my view for a while. You all would have to help me speak the praise, the pain, the trust, and the adoration. At the moment I received the phone call about the accident I was sitting by the serene ocean and relaxing and what followed was a complete contrast but I know with certainty He was in every moment. I was reading a book by John Piper and the chapter was on suffering. The verse I underlined was "But that was to make us rely not on ourselves but on God who raises the dead." 2 Cor. 1:9. It was what I needed, we needed, and although we would never chose it we know God is worthy of our worship even if it costs a great deal, our devotion even if there are things that compete for it, our reliance even if we think we can handle it, and our very lives. I was forced in this all to count the cost, to say to my Jesus I do not count anything as gain compared to you. God held me tight and asked me if I really believe He heals and saves and restores and protects and sanctifies and is worthy of our trust as I proclaim to others. Do I really believe it is true? Do I know it no matter what? The world is not safe. Anywhere. It is fallen. And we are never promised pain-free, easy lives and nor do I want one as these times I sense the richness of His love, the extent of His Grace, the powerful reach and gentle care of His hand. "Through many tribulations we must enter the kingdom of God" Acts 14:22. I am wrecked and humbled and grateful and I stand to say boldly He is good. In everything. I am weak but He is strong and I will boost in this with everything in my soul. "Therefore I will boast all the more gladly of my weaknesses, so that the power of Christ may rest upon me. For the sake of Christ, then, I am content with weakness, insults, hardships, persecutions, and calamities. For when I am weak, then I am strong" 2 Cor 12:9-10. We are content. We are healing; physically and emotionally. We prayed today and took some time to listen. Jason heard FREEDOM again and again. It was profound, we realized that this event has forced us to face our biggest fear; our children dying, and as we looked that squarely in the face we still said we will praise God. We are weak but the power of Christ in us allows us to stand. This has given us more freedom; from fear and freedom to follow Him where ever, when ever, and to whatever He calls. Thank you to everyone everywhere whose hearts were stirred to lift us up. We feel your outpouring of love and care and concern and count it as blessing. We may not get back to you all in a timely manner because right now I am spending time with my family, I am holding them close and we are healing. And we are telling everyone that will listen that God is good, that Jesus heals and saves, and that we can stand and say this because we have seen it. I've been praying since i read your post on Monday. Thank you for writing and for giving God the glory. 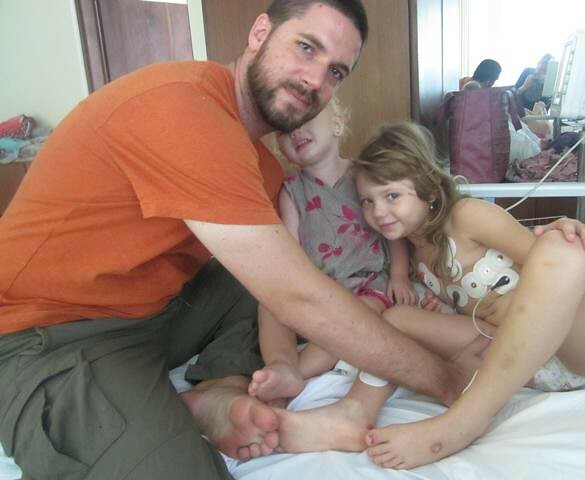 I am so happy that Jason and the girls are alright and praise God that He chose to save them. Thank you for your honesty and I will continue to pray for you guys to have some special family healing time this weekend. We love you!! bawling!!! love you all. praise JESUS!!! Thank you for posting the picture. It warms my heart to finally see a glimpse of them after living through such trauma. We love you all so much! Hugs (It's all I've got - as I'm overwhelmed it seems a physical expression of love would serve best). Absolutely amazing! We are so thankful that God brought your family through this alive! We were praying and praying! God still has incredible plans for your family! We see e a great, great God! Hi Roxanne, we're friends of Jorie, and we've been praying for you guys ever since we heard the news. Your blog post is beautifully written and speaks so well of the awesome presence of God through the hard times. I can only say "WOW!" after reading through the whole thing, especially because your heart is soo disposed to praise Him - what an example for all of us!! Thanks for your faithfulness to Him and for not allowing any of your trust to be stolen. I can only hope that in the face of such trauma my attitude and eyes would be fixed on the Lord as yours were. We serve such an amazing God, He is so worthy of our trust and adoration, and your story is even further proof of that. Thanks so much for sharing - the Lord is encouraging and strengthening many hearts through your testimony. God bless, rest well, hope everyone continues to recover well. Hi Roxanne - I was one of Erica (Engstrom's) roommates in college and we have remained great friends. She sent an email requesting prayer for Jason and your girls. Of course the story grips hearts and inspires really authentic, fervent "God help" prayers. It is so wonderful and encouraging that He indeed said yes to those cries that were lifted up all over the world. Your account is so special and inspiring - that knowledge that there will be trouble in this life and we still serve and trust God no matter what the answer. Thank you for sharing your story and for being such a wonderful example of a true Christ follower. Have fun with your family and know that the family of God is rejoicing with you!!!! I read this after hearing about it from Unity. I am praising the Lord with you! Thank you for sharing your story. It's been years since I worked with you at the 1st Free retreat. I remember that you were a wonderful person to serve alongside. :) I will keep you & your family in my prayers. My heart is in Africa so I will think of you often! "The world is not safe. Anywhere. It is fallen. And we are never promised pain-free, easy lives and nor do I want one as these times I sense the richness of His love, the extent of His Grace, the powerful reach and gentle care of His hand." That is a hard but real truth. and with Annie, I thank you for the photo. I would be interested in hearing more of the medical side, to understand the effect or lack of effect of the electric shock on Jason, Anni and Evy. But maybe there is not much to say, beyond what might have been expected did not occur. Roxanne, thank you for sharing your thoughts and your heart. This was very difficult to read; I'm sure it was much harder for you to write as you thought through the entire ordeal again in detail. We've all shed many tears, but praise God, many of them were tears of joy! Love you all so much. a friend sent your link - I have been bawling my eyes out. HE IS GOOD!!!!!! It was great to hear that our God is still alive and he cares for all of us, even when some people doubt Him. Praise to Him and also for continued healing for all of you , Thanks for sharing this wonderful answer to prayer. How amazing, Rox. I cried the whole way through, thinking the whole time of the lyrics to the song, "Blessed be the Name" (You give and take away, You give and take away, My heart will choose to say, Lord blessed be Your name). I am so relieved and thankful and in awe that things turned out the way they did. He has so much planned for your family. Even now, think of all the people you are reaching with this testimony of faith and trust. Love you and am so, so happy to see pictures of your family alive and well. Just sat down to read your latest posts (was away all week) and am thankful for God's protection over your precious Jason, Anni, and Evy! Your faith is shining through! oh my goodness! i am so sorry y'all had to go through that! praise God that everyone is ok now. I wept with you and rejoiced with you. Praising God for his protection and healing and grace. Your girls are beautiful! We've been upholding all you guys in prayer since you left here. But all the more for the past few days since I heard the news from Jason. It's indeed the Lord's Mighty Hand that was there to protect Jason and the kids. We will continue to lift you all up. We have come to love and cherish you guys since our meeting in our home, though we know each other only for a few hours, it's like the Lord has connected our hearts together. Take care. Blessings on you and your family. May the Lord place a hedge of protection around each and everyone of you. Dear Roxanne, I came across your story via a friend, and I cried as I read your story. You have an amazing and resilient family, not only on earth but also in Heaven. God is with your family, sweetie. I am praying and thanking God that they are still with you. Wishing your girls and hubby a quick recovery. praise be to God!!! thank you, thank you, Lord. I hadn't seen this post 'til just now . . . Oh my gosh, Roxanne and Jason. I cried as I read this. I am still crying. Tears of the terror you must have felt. Tears of relief that you are all OK. Tears of awe at your praising and worshiping Him in the midst of all the unknowns and the pain and fear. I am overwhelmed, and so incredibly thankful you are all OK. I love you guys. Oh my goodness girl. You've got me crying. What a powerful post! Our God is BIG! Praise Him from the rafters for sending that man to help your family. When I was a little girl I got locked in/shocked to a popcorn machine at a recession stand I was working at. It was SO painful! I can still remember how that felt to this day. Thankfully someone was there to pull me off too. GOD IS GOOD! This truly and undoubtly is a miracle, amd to think when you returned to your own home it too was live with electricity. The devil is alive. I still remember my childhood friend who died from an incident almost exactly like this. His mother also was out and the devastation and helplessness she felt and we all felt in our neighborhhood was so profound. I know you are the happiest woman alive on earth!! Crying my eyes out, praying for your family. Beautifully written post. I approach this lady that needed assistance to buy her grandaughters shoes. She explained the horrific accident her family has encountered and the special Haitian man God had sent.My eyes swelter up with tears and thank this lady for sharing her bittersweet story. What a blessing we are given each day on Earth. I truly believe God has his purpose and intentions. May he continue to guide you in the right path and enrich your lives. That day I met your Mom was just another reminder how precious every breath we take really is. God Bless You. I hope the shoes will work and I got the sizes close to comfort . our Sunday at the sandbank.